"How Should Democracies Deal with Dictatorships"
Each week from 1935 to 1956, over 1,000 groups met to listen to America's Town Meeting of the Air. 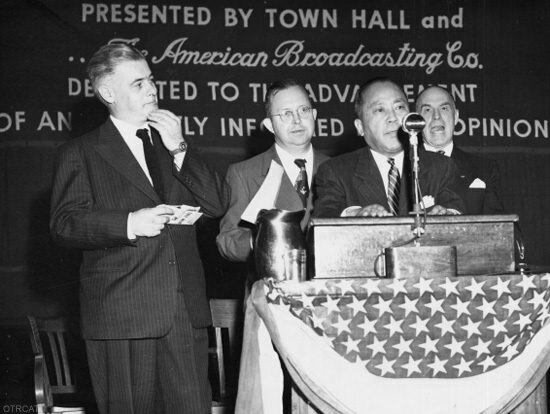 A forerunner of today's live talk shows, American's Town Meeting featured famous newsmakers, writers, poets, scientists, government officials and many more people who discussed current issues and other important topics. When the federal government first began granting broadcast licenses to commercial radio stations, part of the deal was that the broadcasters would develop programing which would serve the public interest. After all, the airwaves were a public resource, those who would use them for commercial gain should be willing to act in the public interest, at least once in a while. This mandate would give to the network news and public affairs departments. Eventually, radio (and later TV) journalism would take on more of an entertainment function rather than pure public information, but print journalism had gone through the same evolution. One interesting experiment in public service broadcasting which was more successful than originally anticipated was America's Town Hall Meeting of the Air. When George V. Denny Jr. and the League for Political Education approached NBC with the show, the network felt it would be an interesting but not very popular piece that would likely run a few months at the most. 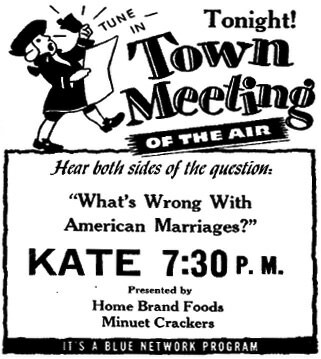 Whether it was the format, the host, the issues or simply the public's desire to understand what was going on in the world, Town Hall Meeting managed to remain popular and on the air until 1952. The program took its inspiration from the New England Town Hall meetings which were the primary form of direct democratic government since colonial times. Citizens from the surrounding area would gather in the hall to discuss issues of importance, from zoning issues to whether or not to seek Independence from England. In recent times, the town hall meeting has become more informative than legislative, but the center piece is always that it is a forum to discuss issues. America's Town Hall Meeting of the Air recalls these traditions by opening with a "town crier" clanging a bell and calling "Town Meeting Tonight!" What followed was what at first appeared to be a panel discussion of important issues of the day, but there was an important difference between this and other panel discussion programs, the audience. In most panel discussion programs, if there was an audience in the studio, they were just there to watch the proceedings. On Town Hall they were a part of the action. If the audience did not agree with the what was being said, they would boo, hiss and heckle the panelists. There was also a question and answer period in the show, although there were rules. The questions were supposed to be short and there was to be no insults or name calling. That did not keep audiences from employing sarcasm when they felt the need. Audience participation was encouraged outside the studio as well, with listening and discussion groups across the country. The show proved popular enough that Denny wrote a monthly column in Current History magazine and there were newsletters distributed about the program. Most of the shows originated from New York, but Denny also took the program on the road several times each season, giving audiences in the hinterlands a chance to ask their questions. Topics ranged from whether the US should involve itself in the European war to how American schools could be doing a better job. Town Hall Meeting was an important piece of the Blue Network's programing, and it survived the transition to ABC. However, interest in the program began to dwindle as television became more popular. Denny was replaced as moderator in 1952, and the show was canceled in 1956. The show was presented with a live audience from the New York City Town Hall and was sponsored by the League for Political Education. The live audience participated in the debates with the panelists, often contentiously. The panelists themselves often got into shouting matches, sometimes threatening to make it physical. The purpose of the show was to get people thinking and get them interested in current events. The first show topic was "Which Way America? Communism, Fascism, Socialism or Democracy?" . Other topics discussed included whether the US should enter World War 2, is there truly freedom of the press in the US and many more controversial and informative topics. See also: University of Chicago Roundtable, CBS World News Today, Democracy in America, Speaking of Liberty and Living in an Atomic Age with philosopher, Sir Bertrand Russel, and I Can Hear it Now (Edward R. Murrow). 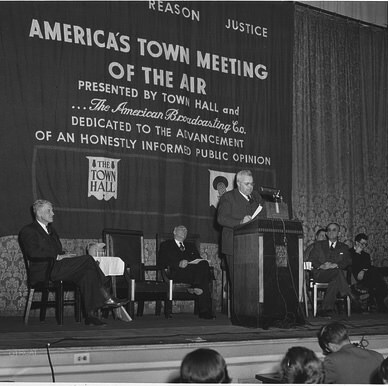 Be the first to comment on "America Town Meeting of the Air"